Leaders at higher ed institutions continue to keep the look and feel of their campuses and campus facilities a priority—although a shift from new capital projects toward working with existing facilities and planning for the future appears to be a trend. Overall, the 163 presidents, chancellors and provosts responding to one UB survey and the 114 campus finance administrators responding to a separate survey are more likely than last year to be launching or engaged in the facilities master planning process. They are less likely than last year to be breaking ground on a new facility, and only 15 percent of the presidents surveyed selected capital projects as a top area of focus from a list of 12 items (compared to one-third last year). Still, about two-thirds of finance leaders expect to spend more or significantly more on facilities construction and maintenance in 2019 compared to 2018. 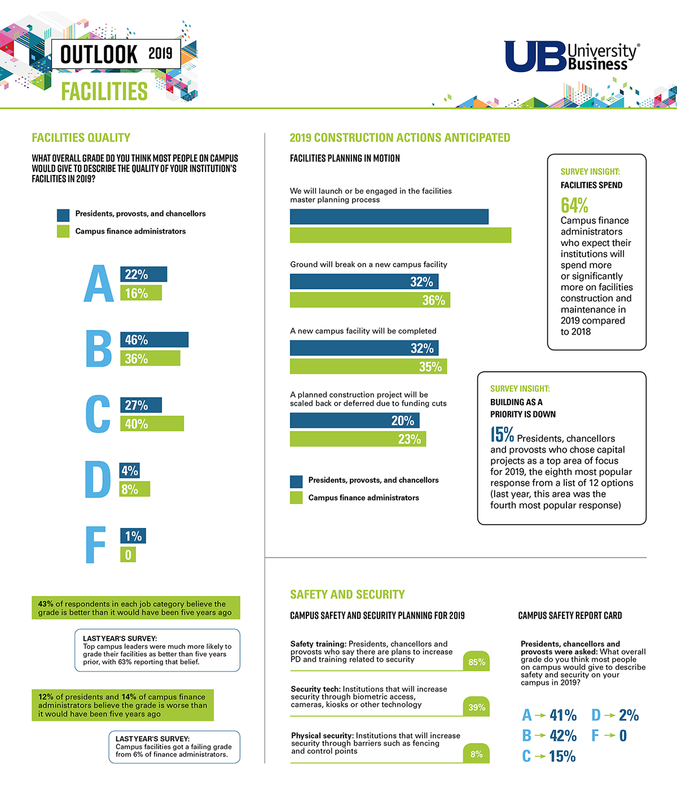 More than two-thirds of president survey respondents say the quality and upkeep of their institution’s facilities would get graded an A or B by most people. That’s down from 85 percent last year. Just over half of finance administrators gave an A or B. When asked to assign a grade people would give to campus safety and security, 84 percent of president survey respondents named A or B. Related PD is a priority for 2019, with 85 percent of top campus leaders noting plans to expand this area of training. The percent of institutions with plans to increase security technology (biometric access, cameras, etc.) has gone down significantly from last year’s survey—from 98 percent of presidents saying it will increase for 2018, compared to just 39 percent for 2019. That may be because the systems are now already in place. About 4 in 10 respondents say their campuses are doing better with safety and security than they were five years ago. Blackboard Inc. announced the execution of a definitive agreement to sell its Blackboard Transact business unit to Reverence Capital Partners, LP.